An interactive workshop for companies and sales teams facing unique challenges when selling into large enterprise accounts. Attention: CEO’s, president’s, owners, sales leaders, entrepreneurs and executives who are serious about driving a sales organization transformation. If you think you are as good as you can get with your Enterprise Selling, then this event is not for you! 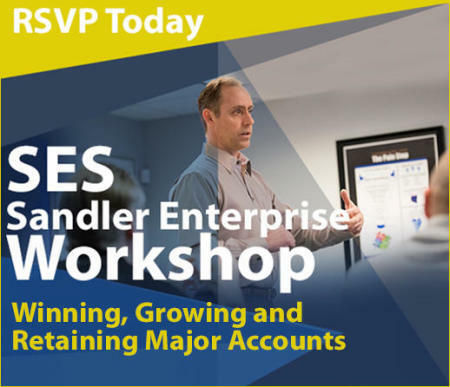 But if you are a lifelong learner and strive to always keep your sales skills around Enterprise Selling up-to-date then you will definitely want to join us for a special interactive morning with Eric Warner and Brian Sullivan of Sandler Training. Make Sure You Reserve Your Spot Below...Seating Is Limited. “First, I wanted to thank you for last week. The lessons you taught in the past SES sessions were incredibly helpful, and I’ve already begun using them. Yesterday I talked through a call plan with my team on how to approach an upcoming meeting. “I feel confident that many of the subjects we discussed will make me more successful. My goal over the next month or two is to use the workbook to practice the concepts to really get them ingrained in my daily sales routines."